Perform both dry and wet grinding of a variety of ingredients in your kitchen with the compact design and motor power of the Preethi Smart Grind wet grinder. Equipped with a shock-proof and durable body for safety, the high torque motor power of this kitchen appliance makes short work of the process of batter preparation. Built for long-lasting use in your modern kitchen, you can now prepare a variety of steamed idlis and fresh dosas for your family meal. The Preethi wet grinder is provided with a single grinding drum made of durable and long-lasting stainless steel of food grade quality. The capacity of this cylindrical jar is 1.2 litres for soaked ingredients. You can also safely keep the prepared batter in the grinding drum after the completion of the grinding. The grinding drum of this wet grinder is easy to detach and fix to the grinder. The Preethi Lavender Grind WG 905 Wet Grinder jar is provided with 2 cylindrical grooved stones, made of natural black stone. This is not only long-lasting in use, but can also be used for fine grinding. The body of Preethi Lavender Grind WG 905 Wet Grinder is made of durable and shock-proof ABS plastic material that is light in weight and built for daily use. 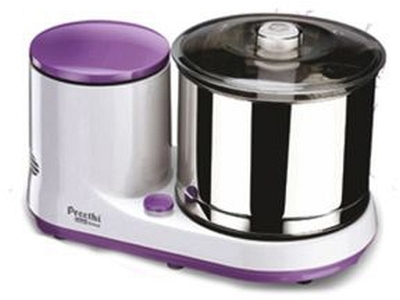 This wet grinder from the house of Preethi is powered by single phase high torque 150W induction motor with a speed of 900 RPM for effective grinding and mixing. Other safety features of this appliance include an automatic power-off feature that shuts off the grinder on completion of the grinding, a built-in motor protector that increases the life of the motor, and a safety lock feature.